Here we are again! This week at Restaurantware we are excited to share with you the latest behind the scene footage with the king of pastry chef Antonio Bachour at the St. Regis Hotel in Bal Harbour. We would like to begin by letting you know more about Chef Bachour and thanking him again for allowing us to enter the “artist’s room” as he was working with Restaurantware’s eco-friendly bamboo serving collection. Antonio Bachour: Raised in Puerto Rico and felt in love with pastry at a very young age due to the fact that he spent his childhood in his family’s bakery. Chef Bachour graduated from Johnson & Wales and he spent the early years of his career as a pastry chef at the Sand Hotel & Casino and Westin Rio Mar. Then he moved to San Juan and worked for two years as the pastry chef at the Ritz-Carlton . 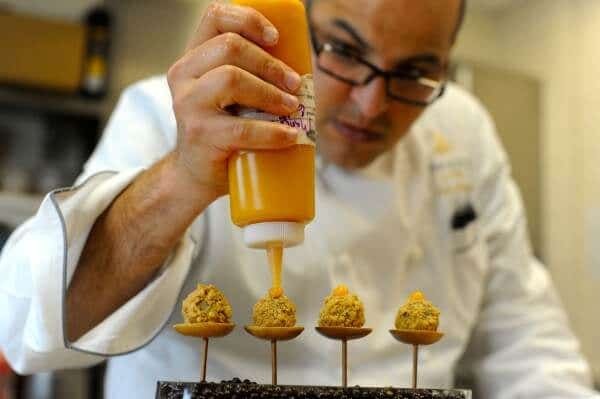 In 2001, Antonio Bachour moved to Miami Beach and became a pastry chef at the Talula. Quickly after moving to Miami Beach, he started experimenting with Italian delicacies in both New York and Miami. 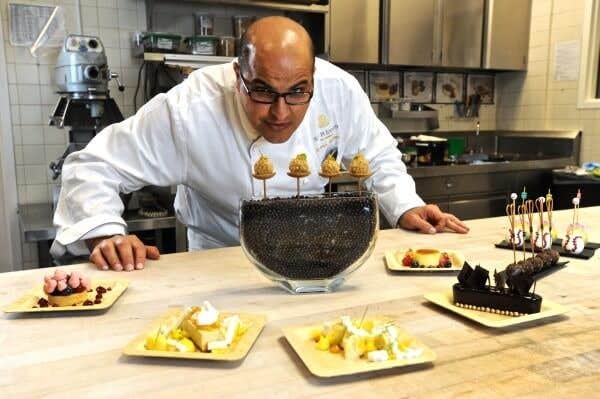 In 2011, Pastry chef Antonio Bachour was also selected as one of “The top 10 pastry chefs” by Dessert Professional Magazine and he is successfully creating innovative recipes every year. Everyone could learn from this amazing pastry chef. As you can see, his creations look simply marvelous on our original Restaurantware Bamboo Collection. 2 (18 ounce) cake mixes (you can use any flavor cake mix or your favorite homemade cake recipe) – Prepare it according to directions or recipe. Prepare cake according to directions on package or recipe, then crumble it up in a food processor. Now, put cake crumbles in a mixing bowl and mix it with frosting. Scoop mixture out and create small balls using your hands, then place balls on a parchment covered baking sheet, then put a lovely heart shaped skewer in each ball. Now, dip into peanuts and chill them until set. You can purchase lovely heart-shaped skewers from Restaurantware. These skewers are both lovely and durable, they had a wonderful touch to any cake pop recipe.